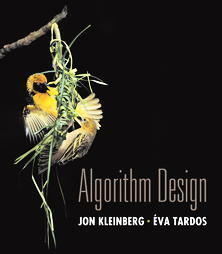 Welcome to the Spring 2010 version of the Introduction to Algorithms Course! 4/19. Please note the following typo on HW8: on the extra credit question, "3/y" should be "y/3". 3/24. Please respond to the second mid-sem survey here. This poll will be open until midnight on Friday March 26. There will be a guest lecture by David Malec on "Algorithms in the real world" on Monday during regular class time. There is no lecture the following Wednesday (3/17). Quiz 2 will be held in class on Friday (3/19). Lectures will resume as normal the week of March 22 (i.e. no extended timings). 3/03. Quiz 2: Quiz 2 will be held during class on March 19. Everything up to and including chapter 6 in the book (basic graph algorithms, greedy, divide & conquer, dynamic programming) is included in the syllabus. The format of the quiz will be similar to Quiz 1. You can take the quiz either from 10:55 am to 11:55 am or from 11:05 am to 12:05 pm. Quiz timing: It has come to my notice that some students need to leave for another class promptly at noon. So I will allow some people to start the quiz at 10:50 am. Anyone is welcome to start at 10:50 am, however, in that case you will also be required to turn the quiz in by 11:50 am. No need to inform me in advance if you'd like to start early. You can just show up to class at that time. Cheat sheet: You are allowed to bring in one letter-size cheat-sheet for the quiz with anything written on it (only one side). Other than this, the quiz will be closed book and closed notes. Homework turn-in: From next week onwards you must turn your homework in at the start of the lecture when it is due. I will not accept turn-ins after 11:15 am. If you email your homework to me, please also do so by 11:15am on the day that it is due. I do not want you to spend lecture time finishing up your homework. Also, please refrain from looking through others' solutions or risk incurring a penalty. 2/1. Shuchi will hold office hours from 9 am to 10 am tomorrow instead of the regularly scheduled 2:30-3:30 pm. 1/25. Solutions to homework 0 are now available here. 1/24. Please note the new homework and exam schedule. We will have two in-class quizes instead of one midterm. 1/19. Please check this space frequently for updates.